Plants annual; taproots semi-woody. Stems 1, erect or ascend-ing, sometimes procumbent, simple or sparsely branched (rarely much-branched) from base or above, stout, to 18 dm, puberulent or tomentulose with short, viscid, whitish or brownish hairs. Leaves principally on proximal 1/3 of plant, petiolate; blade lanceolate to oblanceolate, oblong, or linear, largest leaves 3.8-11.2(-21) × 0.5-3.8(-4.2) cm, base attenuate to cuneate, apex acute to obtuse, canescent to subscabrous adaxially, sericeous-tomentose abaxially. 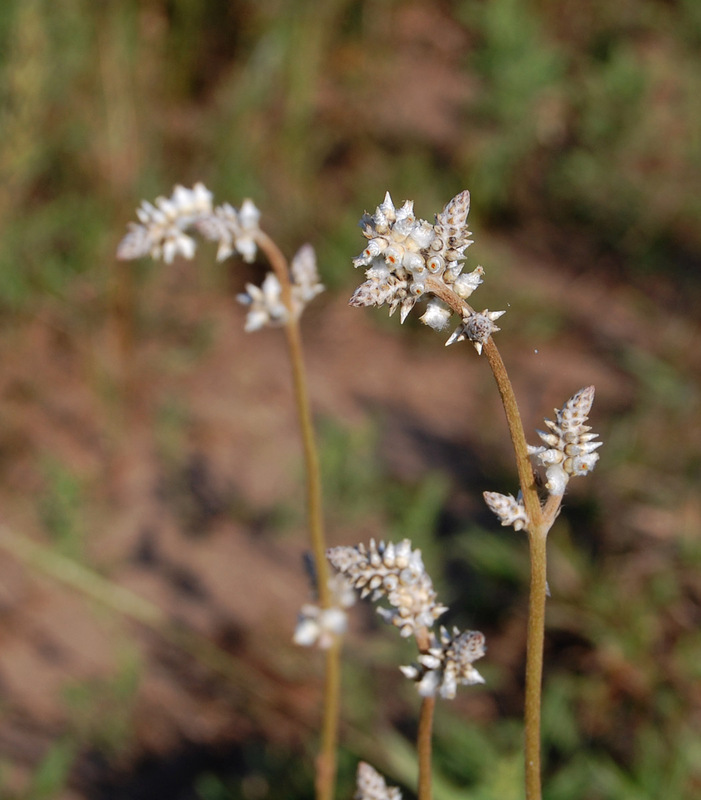 Spikes dense, much-branched, apex often pyramidal, flowers arranged in 5-ranked spiral; bracteoles stramineous or blackish, pubescent with small tufts distally. Flowers 4-6 mm; perianth lobes, greenish white to pinkish, oblong, apex acute; filament lobes slightly to greatly recurved distally, stramineous to pinkish, apex acute. Utricles flask-shaped, 5 × 4-5 mm, with irregularly dentate lateral wings, both surfaces of perianth with distinct spines or tubercles. 2n = 58 + 2. Flowering summer. Open sand prairies, edges of woodlands in sandy soils, roadsides, railroad rights-of-way; Ala., Ark., Colo., Fla., Ga., Ill., Ind., Iowa, Kans., Ky., La., Md., Mich., Minn., Miss., Nebr., N.C., N.Dak., Ohio, Okla., S.C., S.Dak., Tex., Wis.; West Indies; introduced in Australia. Froelichia floridana ranges from broad-leaved stout herbs surpassing 1 meter in height to much-branched plants forming bushes to 2 meters in diameter and single-stemmed, erect herbs 1 dm in height. Much of the variation in the species has been difficult to ascribe to either geographic or ecologic differences and reflects inherent genetic variability and wide environmentally induced plasticity. Although specialists and taxonomists have implied the existence of well-delineated morphologic taxa with a strong geographic correspondence, this is not always true, and, in fact, one encounters typical specimens of any given variety sporadically throughout the range of the species. Some variability in Froelichia floridana is clearly attributable to geography, principally in terms of general morphologic trends. There is a cline toward long, narrow, almost linear leaves as one moves east along the Gulf Coast and into Florida. This would culminate in the little-known var. pallescens Moquin-Tandon, a linear-leaved form (leaf length more than eight times width) from peninsular Florida. Additional variation ascribable to geography is observed in plants traditionally included in F. drummondii, these being large, stout plants with broader leaves, more obtuse leaf apices, and more densely fulvous pubescence on the abaxial surfaces of leaves. Plants of this form are generally restricted south of the Brazos River and continue to the southern extent of the range in Kenedy County, Texas. Further work examining this variation using micromorphology or molecular markers may elucidate a reliable means to identify intraspecific taxa within F. floridana. I have specimens of this species from three counties. One was collected July 7, 1900, by Umbach on railroad ballast near Aetna, Lake County. Another was collected by Miss Madge McKee along a sandy roadside about 6 miles south of Roselawn, Newton County. In 1933 I found a large area of it in very sandy soil in a fallow field in sec. 3 in Starke County about two and a half miles northeast of North Judson. This species in time will no doubt become a weed in the sandy areas of this part of the state. Doubtless introduced into the state. Erect, (3)5-20 dm, canescent or thinly tomentose, the stem stout, tending to be quadrangular; larger lvs mostly 5-12 נ1-2.5 cm; upper internodes progressively longer; spikes terminating elongate peduncles, often branched, eventually to 10 cm, the fls closely set in a 5-ranked spiral, averaging ca 15-20 fls per cm; bractlets rotund, scarious, much shorter than the cal; mature cal soon deciduous, flask-shaped, symmetrical, mostly (4)5-5.5 mm, densely woolly, with 2 lateral entire to dentate or erose wings; seeds 1.6-1.8 mm; 2n=ca 78. Dry, especially open, sandy soil; coastal states from s. Del. and e. Md. to La. ; disjunct inland from Ind. and Wis. to s. Ill. and Mo., and from S.D. to Tex. July-Sept. There are 3 vars., 2 in our range. Coastal plain plants, var. floridana, are robust, to 2 m, with the lowest internode of the infl often 1-2 dm; the peduncles are lanate with hairs to 2 mm, and the larger lvs are mostly elliptic-lanceolate and broadest near or below the middle. Plants of the upper Mississippi Valley region, var. campestris (Small) Fernald, average smaller, seldom over 1 m, with the lowest internode of the infl seldom over 1 dm; the peduncles are more closely hairy, with hairs mostly under 0.5 mm, and the larger lvs are more elliptic-oblanceolate, broadest above the middle, and obtuse or rounded at the tip.